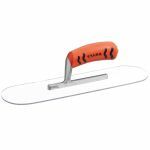 Plexi-Plastic Trowel has an aluminum mounting and is made from a special plastic for better wear. It is used on white portland, interior stucco, swimming pools and on special projects requiring trowels that won't blacken material. "http://www.lewiscontractorsales.com/Merchant2/merchant.mvc?Screen=CTGY&Category_Code=powertools">See our Complete Line of MBW Concrete Equipment.